At CHILI BOOT ART LICENSING we are delighted to offer the beautiful work of another artist who wants his work to contribute to the conservation of the planet. JOSE LUIS TOAQUIZA was born in the province of Cotopaxi, Ecuador and began painting at the age of eight, encouraged by his father, an Ecuadorian naïf artist. 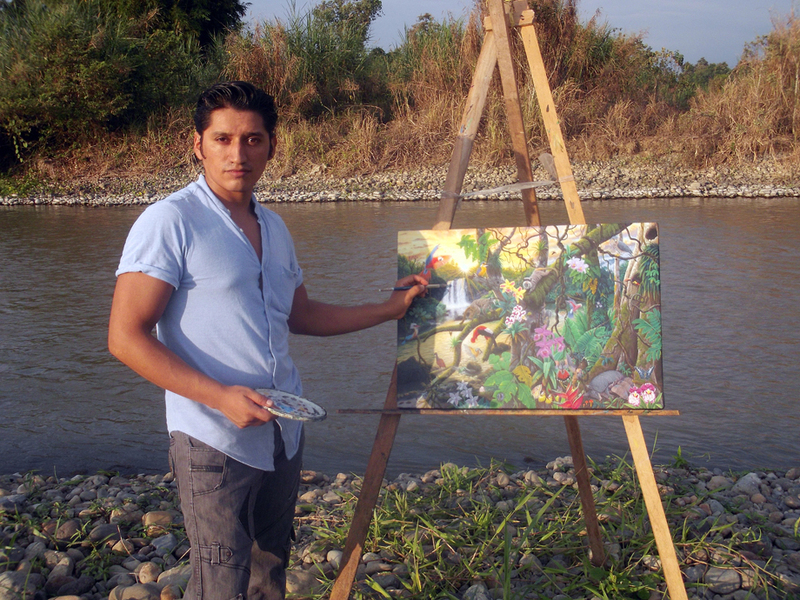 José Luís’ work has impressed critics and public alike with it’s realistic yet magical style, recreating the flora and fauna of Ecuador. His work is intended to make the viewer aware of the conservation of our planet’s natural heritage. We are delighted to be able to offer his highly-detailed, colourful representations of jungle life for licensing. Our first ‘What’s New’ story is about Chili Boot Art Licensing itself. Our first aim is to fill a gap in the market for Latin American art. When travelling in the region we are always enthralled by the bright, vibrant colouring and imaginative imagery employed by local artists and practically feel a sense of duty for those on other continents to enjoy it too, as something fresh and exciting. That is not to say we will not also offer contrasting styles from other regions of the globe. As a result we feel the range of work available from our artists will exceed that on offer from our rivals.